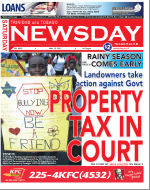 Published on May 27, 2017 in Court, General T&T, PNM, Politics, Property Tax and UNC. 13 Comments Tags: Keith Rowley, Politics, Property Tax, Stephen Kangal, T&T Govt. I read the statement issued by RC Archbishop Harris and a Guardian article penned by SC Koylass both making a misguided and ill-founded case for the collection of the Property tax outside of the the scope of the relevant legislation and quite favourable to the person who seemed to have recruited them. An exercise that is truly voluntary does not need external encouragement by the Minister of Finance bent on mobilising people to join his crusade to collectively defy the Court Order as if he is protected in Parliament. Published on May 20, 2017 in Court, General T&T, Law, PNM, Politics and Property Tax. 1 Comment Tags: Politics, Property Tax, Stephen Kangal, T&T Govt. A determination of the intention of the Executive and the Legislature as expressed in the time-tabling of the implementation of Act No 18 of 2009 is pivotal to the interpretation of the legislation as well as whether the Act has lapsed through non-implementation and non-observance of the dated law. It is also crucial in assessing whether the current bulldozing action being instituted by the Minister of Finance is legitimate and valid or tantamount to misbeviour in public office. Published on May 19, 2017 in General T&T, Law, Property Tax, Recession and Uff Report. 16 Comments Tags: Anand Ramlogan, Colm Imbert, Devant Maharaj, Express, Politics, Property Tax, T&T Govt. A HIGH COURT judge on Friday granted a stay of implementation and enforcement of the decision by Government that all property owners were required to complete and submit a Valuation Return Form. Published on May 14, 2017 in General T&T, Law, People's Partnership, Politics, Property Tax, Recession and UNC. 2 Comments Tags: Politics, Property Tax, Stephen Kangal, T&T Govt. Since the current discussions began on the yet to be known illegal implementation date of Act No 18 of 2009 Prime Minister Rowley has never uttered anything sensible and correct on this issue. He has never read the two mutually inclusive Acts No 17 and 18. He is at loggerheads with the Minister of Finance and his AG. Published on April 25, 2017 in General T&T, Parliament, PNM, Politics, Property Tax and UNC. 2 Comments Tags: Politics, Property Tax, Stephen Kangal, T&T Govt. Taking into account that the former late PM Manning’s 2009 Cabinet had a clear unwavering philosophy and intention that both Acts No 17 and 18 relating to the Property Tax, hurriedly passed without due consultations and proclaimed by 31st December 2009 would be strictly and rigidly implemented at the beginning of 2010, their non-implementation and associated factors have indeed now rendered the tax regime invalid, null and void and in need of re-submission to Parliament for the requisite amendments to be effected to remove the time-lines rigidities. Published on April 5, 2017 in General T&T, PNM, Politics, Property Tax, THA and Tobago. Closed Tags: Politics, Stephen Kangal, T&T Govt. When the The Honourable Attorney General Faris Al Rawi tabled for approval by the House the Report of the EBC/Presidential Draft Order to legalise the package of measures for the holding of the THA Elections in January 2017 citizens saw that a 48,000 THA electorate albeit many absentees were gifted with 12 seats of assemblymen. This formula was deemed a successful and equitable model for Local Government by the PNM in Tobago with 3600 to 4500 electors per seat.